The AS-Lingo Application Framework was developed on the basis of J2EE – today’s leading application architecture. This ensures that applications are available on all hardware or software platforms that support running the Java© Virtual Machine (JVM). Application servers and database servers can be proprietary or open source products. In this environment applications of any high availability platform are also supplied. is not an issue in AS-Lingo. USDM (Universal Software Development Methodology) is the development standard in most leading enterprises world wide. The development platform on which AS-Lingo is installed, is already available in most cases. AS-Lingo was developed on this standard platform and comprises 100% Java©. AS-Lingo is platform independent. It has been installed on Windows® (Intel®), Linux® (Intel®), DB2© (IBM MainFrame), ORACLE®, JBOSS® and WebSphere©. The special advantage of AS-Lingo within this architecture is the AS-Lingo Framework. Additional applications can be easily and quickly developed on this framework. This opens the possibility of bringing new applications, and the migration of old ones, onto a common platform. Flexibility through Application Components. In the future applications must react even more quickly and more efficiently to change. They must meet customer requirements for more flexibility and individual solutions. The object oriented development methodology of J2EE, onto which the component based AS-Lingo Application Framework is built, is our answer to this challenge. Through the large number of available classes and components that have accumulated in this model we have been able to reach a high level of re-usability in development projects. The AS-Lingo Framework supplies an architecture that allows us to re-use an increasing number of components in client and in server development. Language and currency variety are a part of the system. New applications are easily and swiftly created on this basis. The AS-Lingo Application Framework also allows the integration of legacy systems and their applications as we still find them in large organisations. Legacy systems can be integrated, before they are finally migrated themselves, thanks to a large number of tools available to bridge the gap. 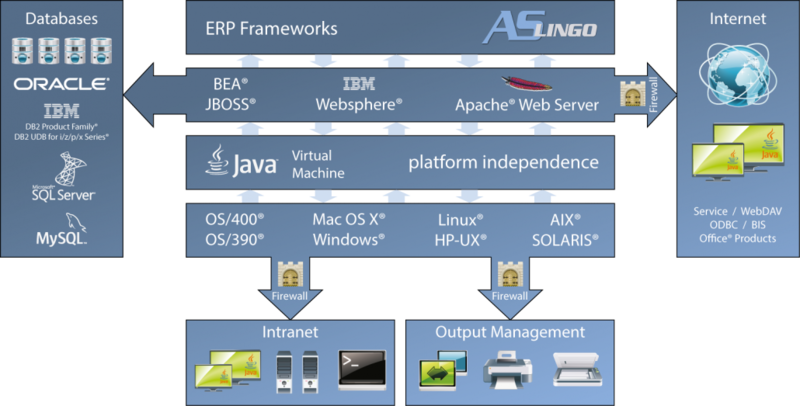 Typical ERP application components are included in the AS-Lingo Application Framework – e.g. The core application of every application system: Financials. Components of Customer Relationship Management (CRM), Supplier Relationship Management (SRM) and Material Management are also included to a large extent. The control of e.g. Dunning procedures, payment procedures or legal tax issues are defined by rules, deposited in the system as defined by the user. The application is started via Java-WebStart©. Java-WebStart© is part of the JDK that ensures the automatic update of the client software every time the user starts the application. A release independent maintenance of the system is part of our offer to customers. Cooperation with partners anywhere is a matter of course in today’s global business world.The user interface of AS-Lingo is a “smart” client (not thin and not fat) that comprises dialogues and panels, reducing the volume of data transferred in the network. A client connection can be local or via the Internet (e.g. remote for sales force). A high degree of reliability and fast response times can be achieved, depending on the size of the server and the software used. The system is extremely scalable and is apt to service a growing number of users.